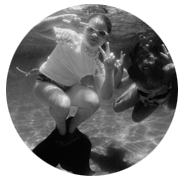 Mermaiding is a delightful, liberating and exhilarating activity. It is a growing trend in Europe, the US, Canada and in South-East Asia. 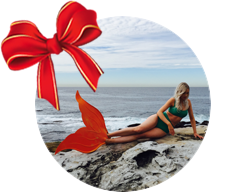 In Australia, thousands of people are buying the fins and costumes they need to experience the joy of mermaiding. Yet, so far, there has been nowhere to turn to properly learn how to use the equipment correctly and safely. No Ripples is here to fill that gap. In mermaiding, we use monofins, sometimes with colourful costumes , to propel ourselves through the water. A monofin is a large single fin used by freedivers to move efficiently through the water to save oxygen. Swimming with a monofin is much faster than conventional swimming, so you can experience a completely new way of swimming, which is exciting and exhilarating. The benefits of mermaiding are far reaching: stronger core muscles, higher endurance, higher flexibility in shoulders, spine and hips, less back pain, better self-esteem, and a happier soul because you are able to get away from the hustle and bustle of everyday life for a while and simply enjoy a new activity! The incredible speed drawn from the monofin is not only a ton of fun but is also extremely beneficial to your body. Kids and water go together like strawberries and cream! Add the thrill and colour of a mermaid and the excitement is palpable. At No Ripples, we are on a mission to make mermaiding both fun and safe for everyone, especially for kids and their parents. If your child has a mermaid fin or you're thinking of buying one, we are here to ensure that your child learns the basics of swimming with a fin under the supervision of a qualified instructor. With care and teaching, your child will beam with happiness and satisfaction as she discovers the new way of moving through the water. Bored with swimming laps in the pool? Would you prefer to improve your fitness while actually having fun in the water? Then our Mermaid Fitness class is for you. I will teach you secrets that took me many years to learn. Mermaiding looks simple and effortless but it’s actually quite a complex activity and there is always room for improvement. After many years of experimenting with different types of fin as a freediver and now as a mermaid instructor, I constantly discover new techniques, I fine tune the details in an effort to move as elegantly and as enjoyably through the water as possible. Do you want to know how I do it? Contact me today and let’s start the journey of discovery. Safety in the water is a primary concern for everyone, and particularly where kids are concerned. As a mum, I know how important water safety is and how quickly kids can get into trouble if they are not properly instructed and carefully supervised. Mermaiding is the most enjoyable water activity, with many health and fitness benefits, as long as it is performed correctly and under adult supervision. Mermaiding also motivates kids to learn how to swim. If you tell a little girl that she can become a mermaid or a little boy that he can become a shark or a merman as soon as they can swim on their own, they will work as hard as they can to become confident swimmers. When it comes to water and kids, most people are worried about safety. And they have a good reason for it. As a mum, I know how quickly can things go pearshape. When mermaiding is done properly, it is the most enjoyable water activity with many health and fitness benefits. Our certified and experienced instructors will show you that there are many different ways to swim with the tail and mermaiding is a lot more fun with a group of friends or with a group of likeminded individuals!